Neah Bay all the Way! Eleven years have passed since the Touchet Indians have made an appearance in the 1B state finals; a place that their opponent, the Neah Bay Red Devils, have found themselves three years in a row. Both teams and fans traveled a combined 425 miles to Tacoma to witness a great matchup in eight on eight ball. Touchet did not seem fazed by the Tacoma Dome’s championship atmosphere despite it being so long since their last trip here, as they had no problem marching for scores on their first two drives, both from Elias Martinez touchdown passes. Down two scores early, the Red Devils rallied for a score after a great kick return from Josiah Greene. He added the 15 yard touchdown run two plays later. Neah Bay forced a three an out on Touchet’s next possession and were knocking on the end zone door at the end of the first quarter. The Red Devils tied the contest on the first play of the second quarter, a 2 yard run from Cody Cummins. They added the 2 point conversion on a reception from senior wide receiver Zeke Greene to take a 14-12 lead. Neah Bay kept the momentum with a critical fourth and one stop on their own two yard line, forcing a turnover on downs and holding Touchet to back to back scoreless drives. Neither team was able to score again in the quarter and Neah Bay took their 14-12 lead into the half. Neah Bay received the second half kickoff and marched down the field on a 12 play drive, capped off by another Cody Cummins touchdown run, his second of the day. The Red Devils kept their momentum soaring as they forced a turnover on downs on Touchet’s next possession and punched in another rushing TD to take a commanding 28-12 lead with 10:41 remaining in the contest. Touchet needed a big play to get them back in this game, and it came with a 50 yard run from quarterback Elias Martinez all the way down to the Red Devil four yard line. But the Devil defense stood strong and forced another turnover on downs. 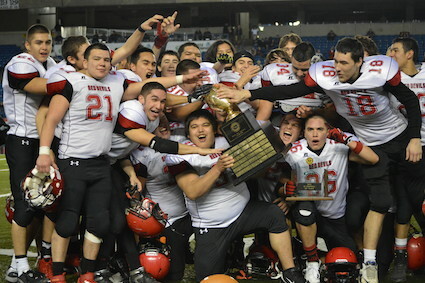 Neah Bay then put together an eleven play 90 yard drive to score its 36th unanswered point against the Indians. Touchet would punch in a score on the last play of the game, but congratulations to the Neah Bay Red Devils for their second state title in three years!